I wouldn’t open a bar and serve drinks in any old glass, but my focus is making cocktails at home so I look at it this way: if I have friends over and give them handmade cocktails, they won’t care what the drinks are served in but they will feel happy, impressed and a little special. The Givens: those glasses that you probably already have in the kitchen. The Basics: the glasses that you should have before you get started. Next Steps: the glasses that you’ll want to use to make specific drinks the way they were intended. Getting Serious: the glasses that are more specific or rare, but probably fun to have when you need them. Those glasses that you probably already have in the kitchen. You might have some drinking glasses, coffee mugs, wine glasses, and maybe some beer glasses (pint glasses, pilsner glasses, beer steins) in the kitchen. Go through the next sections and decide if what you have will substitute for anything or if you need to look at adding to your arsenal. I try to use the intended glassware for specific drinks if I have it but I’m not going to be fanatical about it. Also, you should always choose glass over plastic since glass will chill and maintain temperature better. The wife and I once thought that we should have eight of every dish or glass in case we hosted a dinner party. This practically never happens and having all that glassware just fills up our cabinets. We’ve gone through our kitchen over the years and donated to charity plenty of champagne flutes, margarita glasses and shot glasses that just never got used. For my purposes today, if I want to get a new type of glass, I’ll just buy two. That way I can make a drink for the wife and me and expand from there if we want, without overflowing our cabinets. The glasses that you should have before you get started. 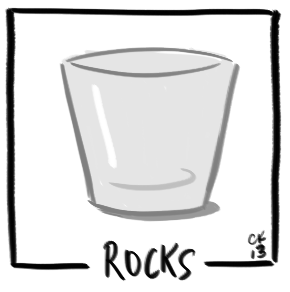 Rocks Glass (a.k.a. Lowball Glass, Old Fashioned Glass, Double Old Fashioned Glass): This short glass is the one that I most associate with cocktails. It’s the one’s you see in the hands of the Rat Pack or Don Draper. It’s for drinking spirits on the rocks (over ice) or neat (just the straight stuff) but also famously known as an Old Fashioned glass because its short height makes it good for muddling the ingredients for Old Fashioned cocktails, which are made right in the glass. The set I have was a wedding gift – far more useful than that electric can opener. I only list the Double Old Fashioned to be inclusive but it’s really just a larger Old Fashioned glass. You may see it referred to as a D.O.F. Cocktail Glass (includes Martini Glass, Coupe): With all the types of glasses that serve “cocktails,” who knew that there is one type specifically called the Cocktail Glass? This is it. 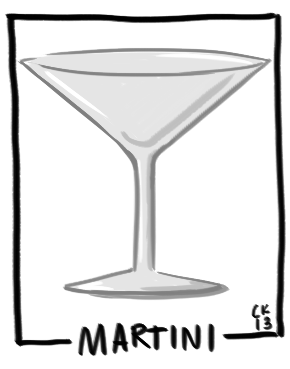 The V-shaped version for serving martinis is called a martini glass by most people but it’s technically still a cocktail glass. 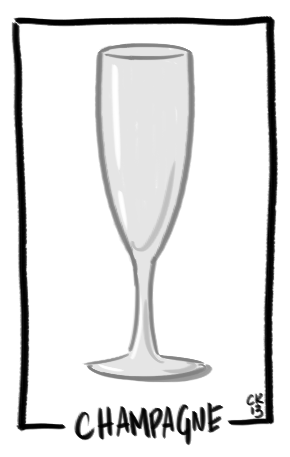 Some observations on the martini glass: The wide mouth makes spilling very easy. The shallow bowl makes fishing out olives a snap. The thin stem prevents warming the contents with your hands. The flat angle of the sides reduce the need to tip the head way back for those last drops, which is good for ladies wanting to maintain a refined appearance. The martini glass is an elegant means of drinking even if the sizes of some have grown to ridiculous proportions in recent times. I bring this up because drinks are meant to be enjoyed cold and freshly made. With these 12 oz. martini monsters, by the time someone gets to the end, the flavor it totally different and the temperature is just bleh. I say it’s better to drink a lot of little fresh cocktails than one big stale one. There’s also the cocktail glass that seems to be having a comeback – the coupe. It’s basically the same idea as a martini glass but the sides round out a bit to form a bowl with a more vertical rim. Because of the shape, coupes make sloshing alcohol a little more difficult. 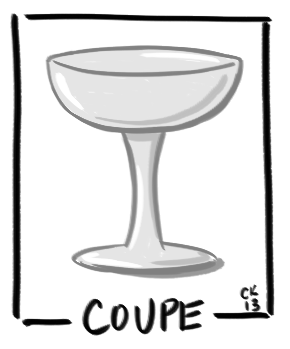 Coupes are generally diminutive, holding a responsible amount which prevents the drawbacks of those giant martini glasses mentioned earlier. Personally, I prefer the look of a coupe. They are versatile because they can pull duty for martinis, manhattans, brandy alexanders, champagne (their original purpose) and more if needed. Coupes can also charm drinkers who aren’t accustomed to their classy retro vibe. Look up some vintage coupes on eBay and see how beautiful they can be. When a recipe calls for a cocktail glass, either the martini or coupe will do. The typical cocktail glass is between 4 and 8 oz. 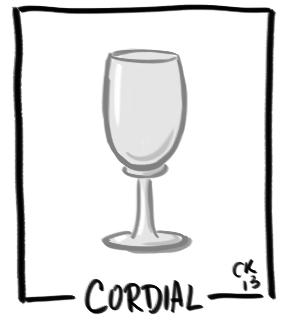 See my next post on my where I got my first cocktail glasses. Highball Glass: This is the tall version of the lowball *smacks forehead with palm* meant for drinks with more ice or larger non-alcoholic portions of mixers. I haven’t bought any special “highball” glasses. I just use my regular household glass drink tumblers. I can’t imagine an official highball glass would serve me any better. The other thing about highballs is they hold larger drinks that have ingredients like fresh juice, soda water or fresh herbs. I’ve found that I don’t always have these things on hand so I usually make simpler cocktails that use the ingredients found in my liquor cabinet. 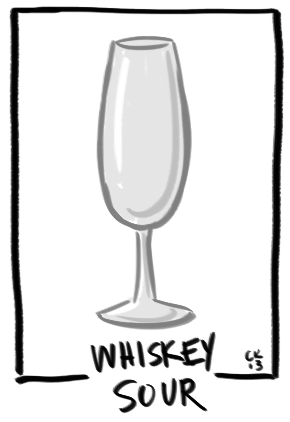 In other words, unless I plan ahead, I don’t have a lot of need for the highball glass. Still, I’m putting it under the basics because it can be used for most of the larger drinks I’d like to make, including bloody marys, collins, long island iced teas, hurricanes, mojitos, even blended drinks like piña coladas. Shot Glass: I was tempted to put shot glasses in the “Next Steps” section but I imagine that this is probably the most common specialty glass that anyone would have in their home. 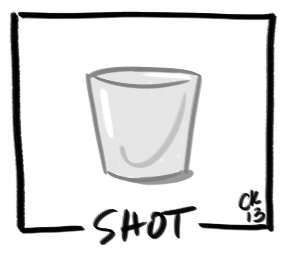 I’m not really into shots yet and if I decide to take a slug of something, I’d probably just put it in a rocks glass. However, I found a great image of shots on Tumblr that shows tons of recipes I’ll be eager to try once I build up my inventory of ingredients. I already own four shot glasses. The glasses that you’ll want to use to make specific drinks the way they were intended. 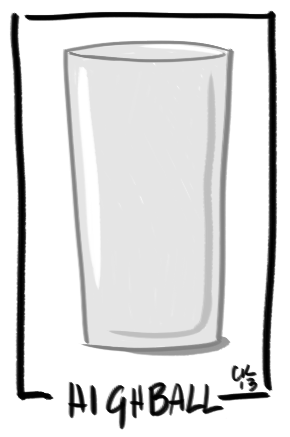 Collins Glass: The collins glass is most similar to the highball glass in shape and size but the collins is taller, thinner, more cylindrical and holds more liquid. The vertical sides of the collins glass prolong the bubbly action of the carbonation in soda water, the major ingredient of its namesake, the Tom Collins. Five months in and I just bought two collins glasses. I waited because I’ve found plenty of other non-collins drinks to make up to now. In a pinch the highball glass should work just fine but I finally wanted to make a collins in a real collins glass. 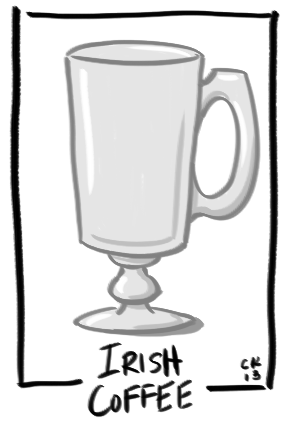 Irish Coffee Glass: If you have coffee mugs, you can survive without these. If you like cute little stemmed glassware that when filled with coffee, whisky and whipped cream make you want to dance a jig, you might want to check these out. I bought four for a small Christmas party but they were never used. Still, I’m glad to own them. They will be good for an Irish Coffee, hot toddy, or mulled cider. Champagne Flute: Apparently the coupe (mentioned above) was designed for champagne too but the vertical sides of the flute keep the bubbly bubblin’ longer. I’ve never been a champagne fan but two drinks I’m interested in trying that require a champagne flute are the French 75 and the Bellini. The mimosa is also an obvious choice. Since we purged our set of champagne flutes a couple years ago, I’m on the lookout for an inexpensive pair. The glasses that are more specific or rare, but probably fun to have when you need them. 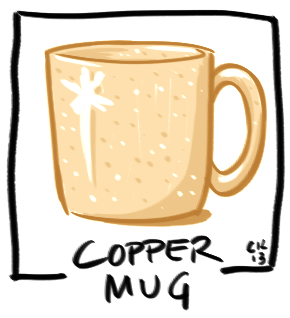 Copper Mug: For me, this was an early purchase. As I said in my first post, I love a good Moscow mule and the way to serve one is in a copper mug. It has something to do with the slight metallic taste the copper imparts. I don’t even know if any other drink calls for a copper cup but I don’t care. I love owning one. 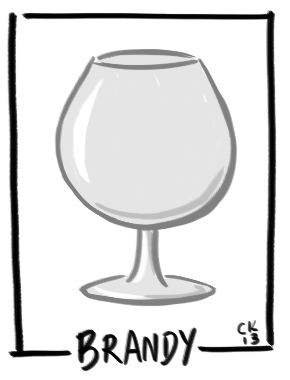 Brandy Snifter: I don’t know much about these and I don’t have one, mostly because I am a total brandy newb. What I do know is that the bowl of the glass is meant to be cradled in the hand to warm the contents. Also, the shape of the smaller opening traps the aromas in the glass for when you stick your nose in there for a drink. Maybe I’ll get one this year. Whiskey Sour Glass: This one is so under the radar, I only discovered it as I was writing this article. I will be exploring the foundations of cocktails and sours are one of the pillars so I’ll consider a sour glass or two if I can even find any. 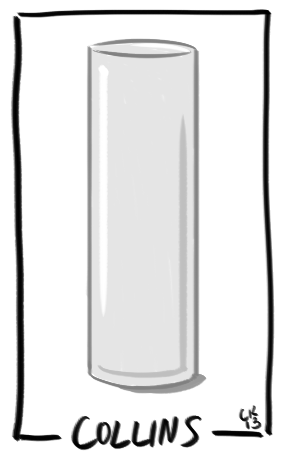 Looking at the shape, I’d think a champagne flute could stand in for now. I’ll look into this more when I get there. 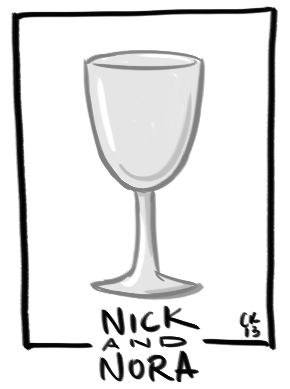 Nick & Nora: This is a cocktail glass and should be found under the Cocktail Glass in “The Basics,” but it is a far less common type of glass so I’m including it here. Its name refers to the main characters in The Thin Man movie and book series from the 1930s, created by Dashiell Hammett. The design is like a mini elongated goblet or a tulip, and it’s fine for serving martinis, manhattans, or Rob Roys. Bonus diversion: here are some of great moments from The Thin Man films. I highly recommend catching them when they show up on TCM. How about you? Which glasses do you absolutely need to make cocktails? What are the “specialty” glasses in your collection? Anything to add or correct, please say so in the comments! Dan always says ” Collins” is best cocktail glass. Thank you for sharing the science. Now where do I get the best for best price?